← Ack, I’ve been hit! I’ve been fighting that dingdang possum all week. So far the score is possum 1, Lou 0. Outsmarted by a marsupial. How smart does that make me feel? But I’m persistent. I think tonight will be my night. Not only has the possum dug up my garden repeatedly, it ate three of my lovely navel oranges off the tree, leaving only one for me. I picked the last orange from the tree today and we had it for brunch along with some huevos rancheros, compliments of the chickens. Given the presence of possums, raccoons, skunks and coyotes in our urban neighborhood, I’m glad we have the chicken run totally enclosed in hardware cloth to protect the hens. 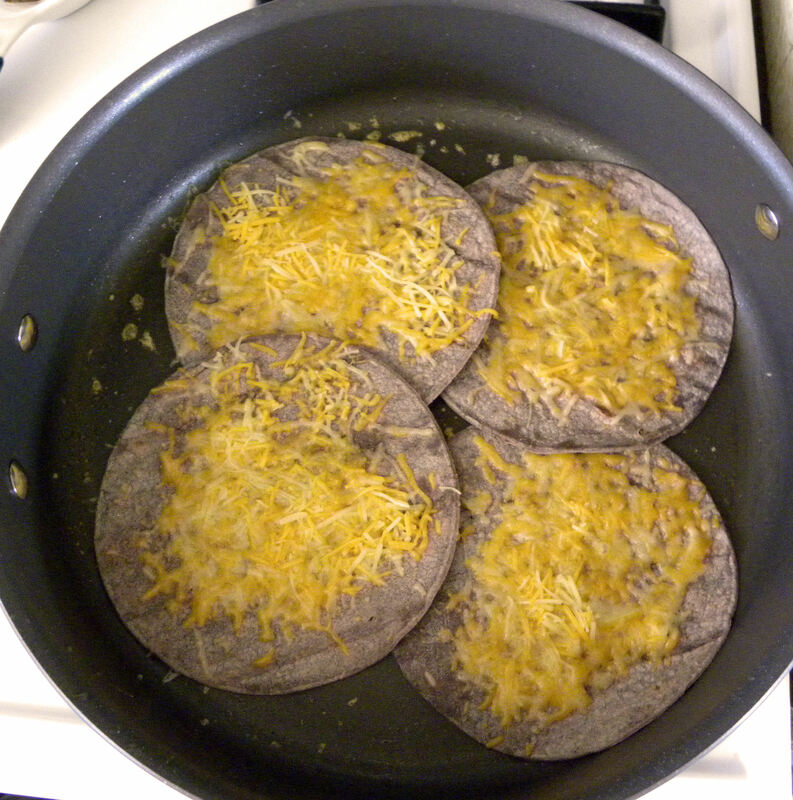 Blue corn tortillas heated with a little grated cheese on top. Huevos rancheros are really easy to make. Heat some corn tortillas in a pan, two per person. I used blue corn tortillas. Flip them over. Put some grated cheese on top of the tortillas and leave them in the pan just long enough to melt the cheese. Put the tortillas on plates. Fry two eggs per person and put them on top of the tortillas. Put some salsa on top of the eggs, and cilantro if you have it. Serve with heated, buttered, and rolled up flour tortillas. Add an orange to the plate if a possum didn’t eat them all. 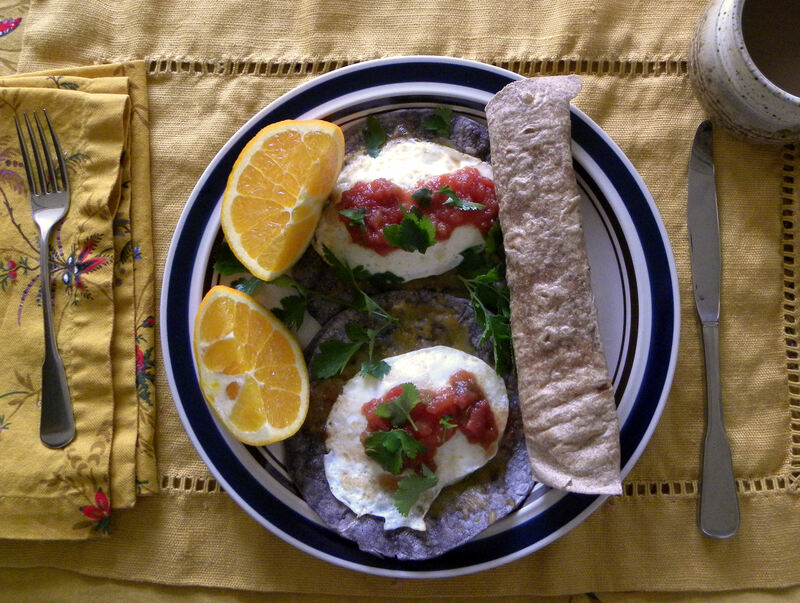 Huevos rancheros make a tasty brunch. 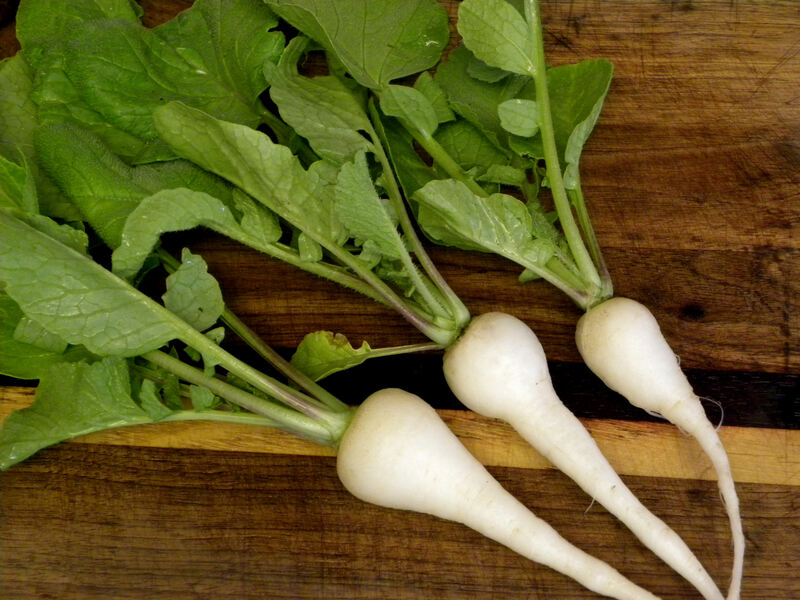 I’m beginning to get a decent harvest of spring vegetables, especially salad makings. 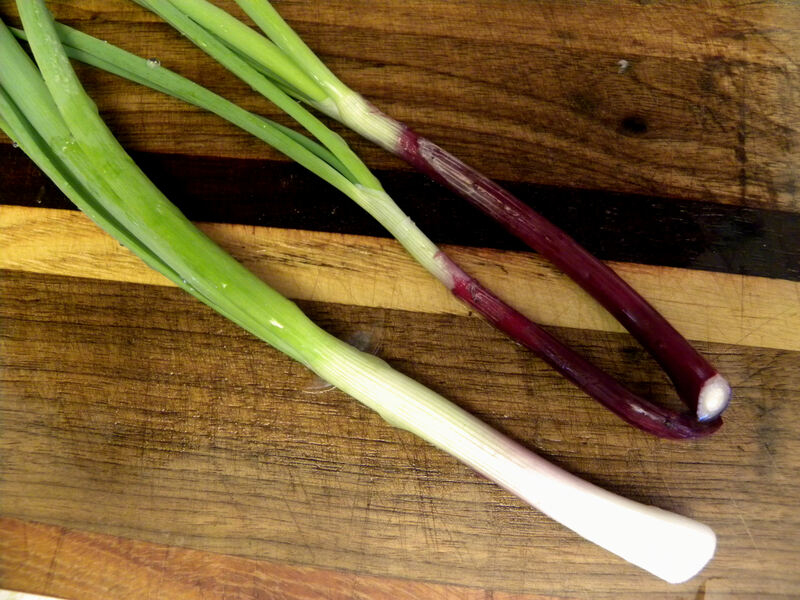 I'm out of green bunching onions right now, so I picked some immature red onions to use as scallions. 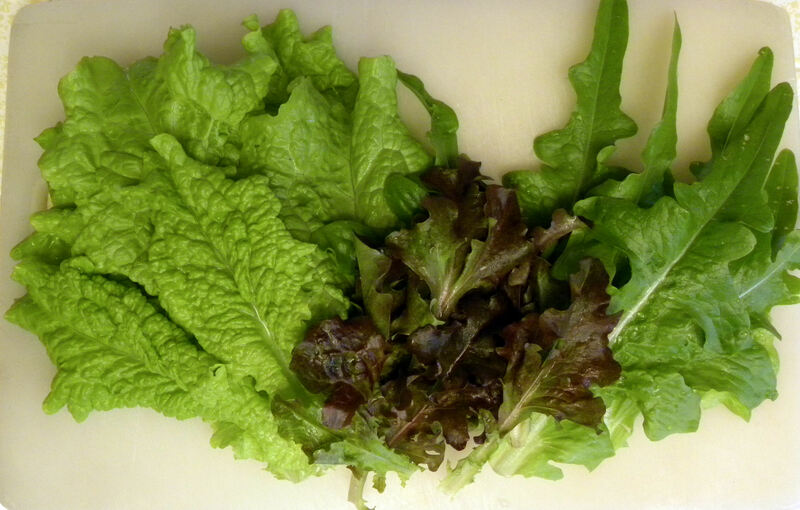 The three types of lettuce ready now for harvest in my garden are (l. to r.) Black-seeded Simpson, Red Salad Bowl, and Green Oakleaf. Total produce 3 lbs, 4.5 oz. The Meyer lemon and five eggs went into a lemon lavender pound cake this week. It was my first attempt at making something with my homemade lavender sugar and I think it came out pretty well. We ate it before I could photograph it. The amazing thing is that our homegrown eggs are so flavorful, that I could actually taste the eggs in the pound cake. I feed my chickens a lot of greens and I think that’s what makes their eggs so tasty. What I don’t include in my produce harvest tally is all the greens that the hens eat. My broccoli crop and green cabbages were a bust as far as human consumption goes, so I’m feeding them to the chickens along with big handfuls of cilantro, parsley, nasturtiums, kale and weeds every day. It’s also spring planting time. This week I planted three kinds of heirloom patty pan squash–Bennings green tint, white, and yellow. The first snow pea is ready to pick, but what am I going to do with one snow pea? I think I’ll wait a few more days until more are ready. My wax bush beans have their first true leaves, the sunchokes have broken ground, the strawberries are blooming, the grapes have sprouted new leaves, and the blue potatoes are up. Two of my peach trees have finished blooming, while my Panamint nectarine and blueberry bushes are in full bloom. It really looks like spring here. If you had a harvest, visit Daphne’s Dandelions and post your harvest on Mr. Linky. This entry was posted in Uncategorized and tagged Harvest Monday, huevos rancheros, opossum, recipe, vegetable garden. Bookmark the permalink. If I had one snow pea it would go straight into my mouth. Not much else to do with one. Your huevos rancheros look wonderful. It is one of my favorite dishes. Somedays I add a little refried beans too, but not always. And they get sprinkled with pickled jalapenos if I have them, which isn’t right now sadly. Daphne, what a good idea. Eat the one lone pea! Why didn’t I think of that? I just went out and gobbled it up. Soon I’ll have enough for my first pasta primavera of the season. That is an impressive harvest, in spite of the marsupial damage. I do know how frustrating that can be, dealing with the animals. Pattypan squash were my mother’s favorite. I always grew some yellow and white for her, as well as for me. It all looks lovely, especially the huevos rancheros.! Thanks, Villager. It tasted good too. That’s a nice harvest, I wish we can have year round citrus trees here.